Evelyn Manesta (born 1888), Suffragette and governess. Sitter in 3 portraits. In April 1913 Evelyn Manesta and Lillian Forrester smashed the glass of thirteen paintings in Manchester City Art Gallery. At their trial, Forrester stated it was important to make a protest in Manchester where Emmeline Pankhurst had founded the militant movement. 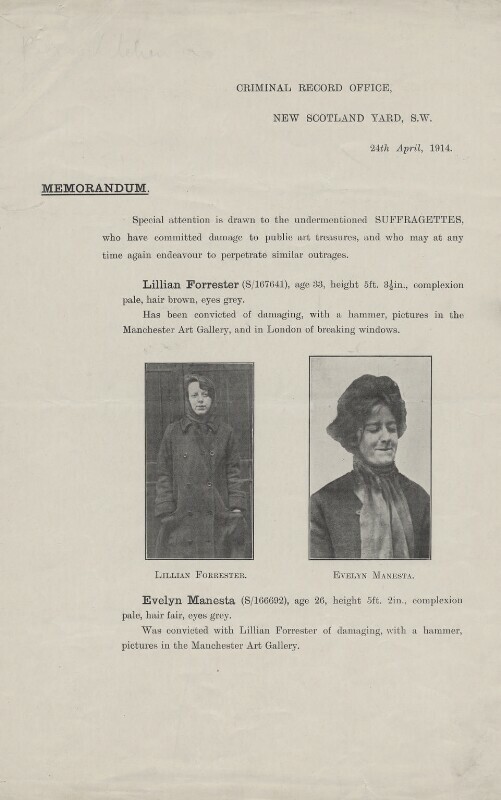 This memorandum, drawing 'special attention' to Manesta and Forrester, was issued by the police to the National Portrait Gallery following Mary Richardson's attack on The Toilet of Venus (The Rokeby Venus) by Diego Velázquez at the National Gallery.